Like most of you, we try to find the value in everything that we possibly can – even others’ “trash”. We pride ourselves in being fair and yet competitive with the bigger guys. 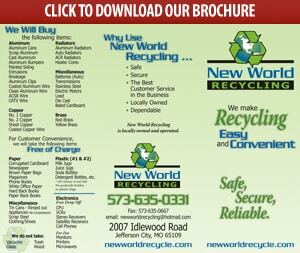 New World Recycling is a locally-owned, family-run business and we have been in business for over 15 years in a small community – so we must being doing something that others like. We try to keep clean, efficient locations and we value quality customer service to the utmost. Come and check us out – together we can make this world a cleaner place to live and earn a little cash too.